Kapihe and his prophecy. 1862. When Kamehameha I was ruler over only Hawaii Island, and not all of the islands were his, and while the eating kapu was still enforced, and while he was living in Kohala, Kona, Hawaii, it was there that a certain man lived named Kapihe, and his god was called Kaonohiokala. This man named Kapihe went before Kamehameha I and before the alii of Kona, and he said these words, “Listen, O Chiefs, a malo will stand, forty in length, as a path for the god; the god will come down and live with man, and what is down here will rise up above, and the archipelago from Kahiki* all the way to Hawaii will be joined as one. This is the sign that will come before this: there will be forty days of darkness and then rain will fall and thunder will crash and lightning will flash and seven rainbows will arch; there we will see the dead rise from the graves and all people will see their parents and hoa hanau [siblings, cousins] who died earlier.” And that is what Kapihe said to the King, alii, and makaainana. The chiefs and commoners were astounded at these shocking words spoken by Kapihe, and they called him crazy. This perhaps is the truth, for some of his predictions came true and others were denied. This is how people are mistaken, they say, the heavens and earth will come together, and Hawaii and Maui will join together, and so too with Kahiki. And if that is the case, according to the mistaken ones, then God is not in heaven, and there is but one God, and that is Kapihe; that is what they said, and because all of the lands did not merge together as the they were saying, Kapihe was called a lying, crazed person. *Kahiki usually refers to foreign lands. 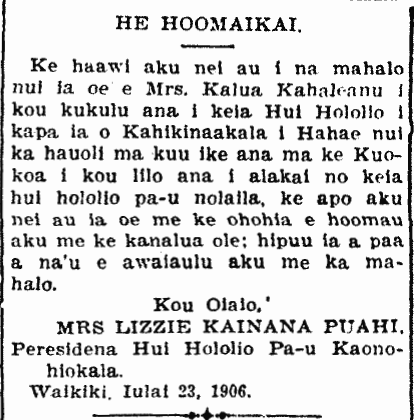 Ka Hoku o ka Pakipika, Buke I, Helu 26, Aoao 1. Maraki 20, 1862.